Question: I added some movies in my iPad and now I can't delete those movies to free up storage, how can I fix it? Videos can occupy large amount of space at your iPad. If your iPad is running out space, you'd better check out the storage of videos. You would be amazed by how much space videos can eat up on your iPad. iMyFone TunesMate is the most media transfer application by iOS users to download, sync iTunes between iOS and PC. It is an easy and direct way to delete movies & data and is mostly widely used alternate for iTunes. 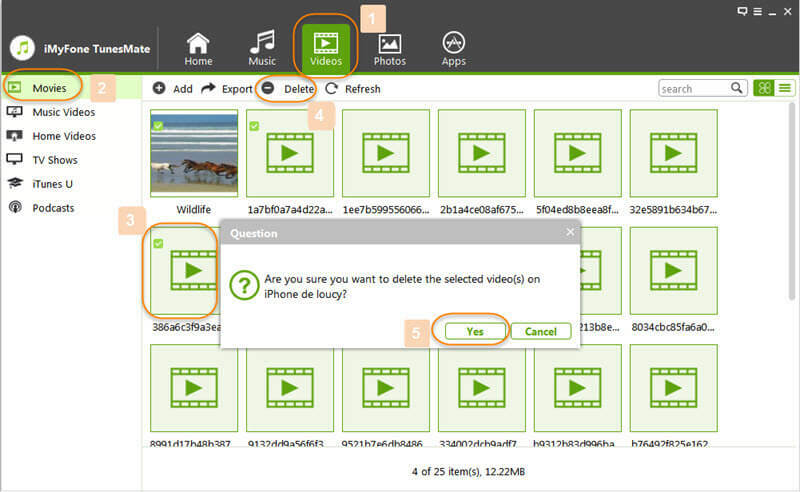 Delete Movies in Bulk: You can delete all the unwanted movies in bulk with iMyFone TunesMate. Add movies from PC: All your local movies on PC can be added to your iPhone with 1-click! Purchases & Non-Purchases: Of course you can transfer iTunes purchases movies, but you can also transfer free downloaded movies. Two-Way Transfer: Freely transfer media files between iPhone and computer without any restricts. Backup & Restore: Backup your iPhone or iTunes media and restore it back if you need in the future. Utilizing iMyFone TunesMate is a definitive approach to disposing of extra movies from your gadget without exploiting iTunes by any means. How may you do that? Below are the steps required to delete movies from your iPad. Step 1: Download and launch iMyFone TunesMate on your PC. Step 2: Connect your iPad with PC to get access to iMyFone TunesMate using a USB cable and get access to your data and movies through your PC. Step 3: Go to videos tab. Select the videos you want to delete and click on “Delete” button at the top bar. If you only need to delete a single video, just select that video. Step 4: A pop-up window would ask you to confirm, click “Yes” to complete the process. Part 2: How to Delete Movies Directly from iPad? Most users download and store movies in their iPad, which take up a humongous measure of space. Most users find it difficult to delete movies from their iPad. Here are some ways from which you can delete videos from your iPad. Step 1: Navigate videos at Settings. For iOS 8: Go to Settings > General > Usage > Manage Storage > Videos. For iOS 9: Go to Settings > General > Storage & iCloud Storage > Manage Storage under Storage > Videos. Step 2: Find the video/movie you want to delete and swipe it to left, and then tap the red "Delete" button. Step 1: Go to Albums on your iPad. Step 2: Open Camera Roll and select the video that must be deleted. Step 3: Tap on it and you will see a "trash can" symbol show up in the upper right corner, press that button and the movies will be deleted. When you wish to delete the movies adjusted from iTunes, you should backpedal to the iTunes on your PC. From the library there, clients can uncheck the specific movies to ensure that it doesn't synchronize back when the gadgets are associated once more. By following this method, the movies will keep inside the PC but won't consume additional space on iPad.